In 1923 Max Friz built ze first BMW Boxer, and it was good. Then there were two pesky wars that interrupted business for a few decades, but by the `50s things were back in semi-action. In 1970, BMW parted the Atlantic Ocean, and its new series of /5 air-cooled Boxers escaped to America. In 1993, the oil-cooled Boxer arrived; five years of maturation resulted in this naked R1100R version. Twenty years later, BMW still builds the R1200R roadster. Whirled without end, amen. In 1994, BMW released to an utterly confounded public a naked version of its modern Boxer. Some loved its funky styling, some thought it just plain ugly, but it made a distinct impression on everyone. Mechanically solid, enough people liked R1100R’s distinct lines to convince BMW that the only revisions necessary were a new chromed and concise instrument panel and larger headlight. We received the slightly revised BMW R1100R about a month before our Bikini Bikes test, and we thought its bold looks and minimalist approach would complement the delicate lines of the bikini machines. styling, don’t ignore the R1100R in the fashion department. Unlike its more conservative siblings, the R1100R doesn’t hide gadgets. Rather, they are exposed proudly. Oil coolers, the telelever front end and fuel injectors are all on display as part of its post-industrial design esthetic.The major difference between the revised R1100R and the 1995 model we tested previously is an improved instrument panel. The new edition dash, crafted from machined aluminum and chrome, is much easier to read and makes for a very attractive layout. On the road it’s typical BMW: sure footed and torquey. Although the ergonomics are spread out and comfy, they are aggressive enough to tear up the back roads. The wide seat offers great support, and our test passenger loved the rear seat accommodations, but long distance saddle endurance is hampered somewhat by the lack of wind protection and its high bars. It’s not surprising then that one of BMW’s best selling accessories for the R1100R is the windshield. On twisty canyon roads, the R1100R rides exactly as designed. It is brilliant at a 7/10ths pace, but push faster and the ABS is overwhelmed. Below this, the no-dive telelever front end, excellent brakes, and quick steering geometry make the naked Roadster a confidence inspiring blast to ride. In city traffic, these same qualities create a nimble, powerful commuter bike. In stop-and-go situations the bike pulls slightly to the right, due mainly to the sideways-rotating mass — but this is easily corrected. 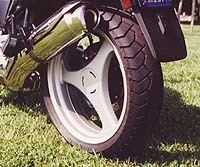 The major drawback of the R1100R is its width. 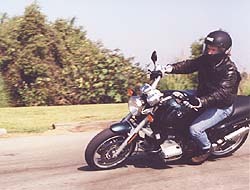 The wide, protruding flat twin cylinders can make lane-splitting difficult in a state where it is legal. 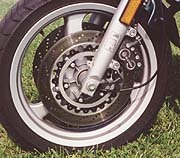 The 1998 R1100R lists for $9990; $11,495 with ABS. A MO staffer commented that the R1100Ris not as exotic as the bikini roadsters, and for a competent standard he preferred a Bandit 1200. But for those wanting something funky, capable, fun, yet practical, the R1100R is in a league of its own. Manufacturer: BMW  Model: 1998 R 1100 R Price: $ 9,990 ($11,490 w/ABS) Engine: Air/oil cooled twin  Bore and Stroke: 99 x 70.5mm Displacement: 1085cc  Carburetion: Fuel injection Transmission: Five-speed Wheelbase: 57.99 in. Seat Height: 29.9 to 31.5 in. Fuel Capacity: 5.5 gal. Claimed Dry Weight: 506 lbs.